Wasn't the original name for these lunch snacks "fruit cocktail?" Definitely not PC these days. I remember going through the lunch line and being served a soupy ladle of miscellaneous fruit pieces only remotely identifiable by their shape and whatever texture was left after soaking in a jar for possibly decades. It's gotten better...well except for the individual, disposable plastic servings being chucked in landfills. But just look at the color. Aren't they pretty? Directions In a large, glass measuring pitcher, mix the Jell-o mix with one cup of boiling water and one cup of orange vodka until all the powder dissolves. 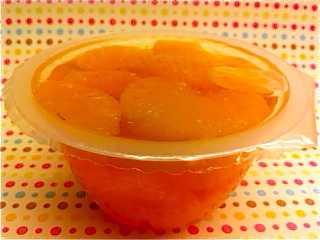 Allow to cool for 30 minutes, then add the Mandarine fruit pieces. 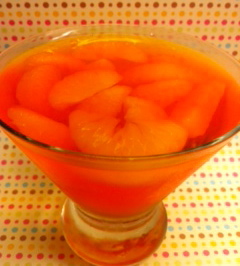 Pour the mixture into martini glasses and chill until the Jell-o is solid. Serve with a spoon or ladle.